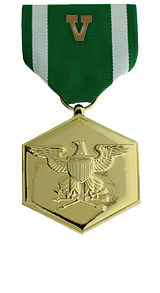 Meritorious achievement while serving as 3d Squad Leader, 3d Squad, 1st Platoon, Company K, 3d Battalion, 3d Marines, Regimental Combat Team 7, I Marine Expeditionary Force Forward, on 11 May 2006, in support of Operation IRAQI FREEDOM. On this date, while manning an observation post, Sergeant Anders’ squad came under intense enemy small arms fire from an abandoned hotel. Sergeant Anders quickly maneuvered his squad into an advantageous position in order to gain fire superiority, while simultaneously requesting a quick reaction force and close air support from higher headquarters. His squad was able to effectively cordon off the hotel, severing the enemy’s egress routes until reinforcements and close air support arrived. Sergeant Anders then directed the placement of the quick reaction force in the cordon, thereby, controlling three separate maneuver elements while under fire. Sergeant Anders’ leadership and calmness under enemy fire led to the destruction of an enemy safe house and the death of at least five insurgents. Sergeant Anders’ initiative, perseverance and total dedication to duty reflected credit upon him and were in keeping with the highest traditions of the Marine Corps and the United States Naval Service.